The average height of the Peruvian Horse is between 14 and 15.2 hands, and the weight is commonly between 900 and 1100 pounds. The head shows power and vigor,with a straight line or slightly concave profile,strong at the bottom with out thrust jaw and is carried inwards. The eyes are expressive, dark, elongated, wide set, and sensitively dilated . The nostrils are long. The neck is of medium length with a gracefully arched crest, it is set high and runs well back into discretely marked withers. The mane and forelock are naturally fine, long, and lustrous. The body is well- proportioned, length to height , medium-size,with strong, well developed , deep and wide thorax , a well - arched rib cage with a short, wide girth, the joining of the shoulder blades being smooth and level with the croup. The chest is well-proportioned , strong, wide, and well muscled. The back is short to medium in length, strong and rounded. The bottom line of the barrel runs nearly horizontal. The limbs are solid and firm and stand in proper alignment. The shoulder is long and very well inclined with an open angle at the elbow giving the front limbs free and graceful movement. Proper joining is the basis of the animal`s correct alignment and poise, and the width and strength of the articular joints are indispensable for proper movement of all these parts. The arms are usually short and muscular. The forearm is long and muscular at the top, and slimmer below. The knees should both be well-modeled , with slightly convex rear face.The cannon bone is short with well defined sinew. At the hindquarters the thigh should be well-joined to the croup and rump, showing powerful but not excessive contraction.The leg muscles should be outstanding, the rump rounded down to the thigh but not to low.The hocks should be well-formed and defined,tending inwards, with strong, lean bone structure, and well balanced proportions. The tail should start rather low, carried quietly, close to the rump, and long and fine.The leg bone and shanks (called the gas kin) should form a sufficient angle to give support, leaning towards the center of gravity most of the time. The shanks are short, strong, with good bones,strong tendons,well implanted and defined. The fetlocks strong and lean well-outlined with precise contours and rather sharply angled. The pasterns strong, medium length, fine and clearly defined, and springy with a slope equal to that of the shoulder. The hooves should be hard, well rounded, concave inner sole, and a long wide prominent frog, and of good size proportionate to the horse with slopping walls and sufficient high heals to permit the proper projection of the angle of the pasterns. 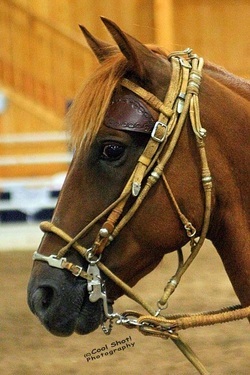 The Peruvian Horse, because of its direct link to the Barb Horse, comes in a array of striking color tones and shades, coming in all basic solid colors as well as grays and roans. There is discrimination against animals with marked albino factors and rejection of dappled ones.